Only available TODAY only! Teefury: Limited Edition $11 tees! are t-shirts that are limited to that day, if you wait to long, it will be gone the next day. Even more exciting they have added larger sizes, you can get a 2XL for a $1 more, and a 3XL for $2 more. They have also added more color choices for different T-shirts on different days. Today’s design is from an artist who affectionately calls it “Vulcan Awesome“ , Spock couldn’t have said it any better, this T-Shirt is awesome, if you visit the link, there is a Star Wars one that its in battle with called “Falcon Crazy” but I like this shirt better, so Live Long and Prosper, and buy some of these, will make great gifts! I love this T-Shirt! I bought mine! The t-shirts start at $11, and come in varying sizes for men and women! So don’t miss out. Head on over to TeeFury.com today and pick up one! As always thanks for stopping by! and have a great day! 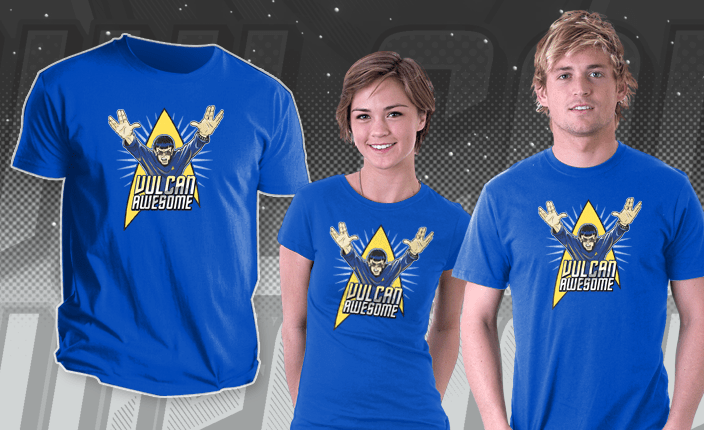 The ‘”Vulcan Awesome” Live Long and Prosper’ is AWESOME. This is so original… you can’t help but smile when you look it. I was laughing before I even opened the e-mail.